Published: Dec. 23, 2018 at 01:14 a.m.
Baltimore Ravens cornerback Brandon Carr intercepts Los Angeles Chargers quarterback Philip Rivers on his first pass. 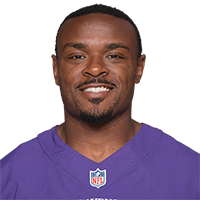 Published: Oct. 22, 2017 at 06:50 p.m.
Baltimore Ravens defensive back Brandon Carr intercepts a tipped pass intended for Minnesota Vikings wide receiver Laquon Treadwell. Published: Sept. 17, 2017 at 04:29 p.m.
Baltimore Ravens defensive back Brandon Carr picks off Cleveland Browns rookie quarterback DeShone Kizer to seal the game. Published: Sept. 10, 2017 at 01:48 p.m.
Ravens cornerback Brandon Carr catches a deflected ball for his first interception as a Raven.